Reuse, if implemented strategically, has the potential to reduce development costs and improve product quality and time to market dramatically. But, how can teams do this at scale for complex products and systems? Features are a useful level of abstraction above the requirements, designs, tests, implementation artifacts, and (in some cases) calibration data that define a product. A feature model defines which features are part of a particular product, the variation points in the product line, and the constraints among features. Now imagine combining that with Global Configurations in the IBM IoT Continuous Engineering Solution. Being able to define development streams and baselines across engineering disciplines including their trace links. Enabling reuse of component configurations consisting of these engineering artifacts in multiple tools and repositories – and whole hierarchies of configurations in a complex product. Work in a product line superset development stream (a global stream). Define variation points in requirements (managed by DOORS NG), designs (authored in Rhapsody and available on the web via Design Manager), tests (managed by RQM), and source and calibration files under Jazz SCM. Use the pure::variants feature editor right in the tools’ user interfaces, for example while editing a module in DOORS NG. Use and reuse parameter values across your engineering artifacts. pure::variants 4.0 generates a new product variant by driving the IBM tools to branch from a superset development baseline, interpreting the feature model in pure::variants, and transforming relevant artifacts in the target stream in each of the IBM tools. This is true reuse, since artifacts in the target stream maintain the same ID and “concept URI” while unmodified artifacts in the new stream are exactly the same version as in the superset baseline. The IBM tools maintain the system of record, making it possible to see where something is used (and reused), the dependency relationships, and the history of changes. This enables automated reporting, analysis, document generation, and auditing. To learn more about pure::variants and what you can do with a joint solution by pure-systems and IBM, see their press release or 4.0 release overview. 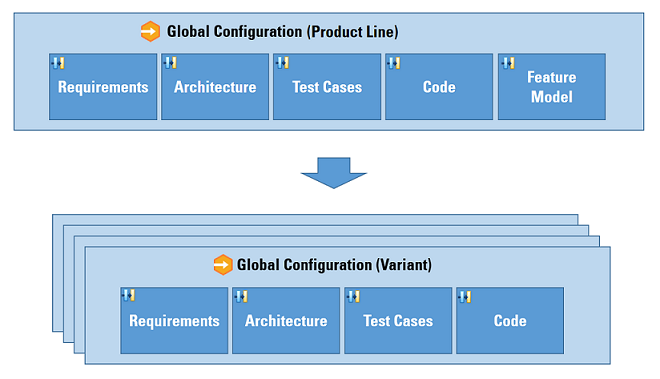 To learn more about reuse and parallel development of requirements, designs, tests and implementations through configuration management (including global configurations) I recommend starting with “Configuration management: concepts and capabilities” in the IBM Knowledge Center.